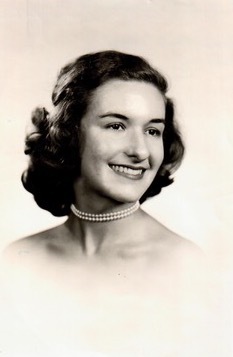 Jean Lloyd Ledden, age 89 of Winter Park, FL died Tuesday, August 28, 2018. Graveside services will be 4:00 PM Sunday, September 2nd, at Mt. Hope Cemetery in Southern Pines, NC. The family will receive friends at Powell Funeral Home on Saturday from 6:00 - 8:00 PM. A native of Sanford, NC, she was a daughter of the late John M. and Ruth Porter Lloyd. She was a graduate of Jonesboro High School and received her Bachelor of Science Degree from UNC Greensboro. In 1951, she married Lynn H. Ledden, also from Sanford. Lynn and Jean first settled in Southern Pines where Lynn taught school and Jean worked as an Executive Assistant until they started their family. Eventually they settled in Potomac, MD, and Washington, DC, where she lived for 46 years before moving to Florida. Jean was a loving mother and devoted wife to Lynn during his many years of illness until his death in 1995. She enjoyed traveling – celebrating her 80th birthday sitting in Times Square - and making friends with people wherever she went. After raising her children she returned to work as an office manager for DeMarne & Day Construction in Potomac, MD, and then spent many years as the first Volunteer Coordinator for the Strathmore Music and Visual Arts Center in Bethesda, MD. In addition to her parents and husband, she was preceded in death by her brother Glen D. Lloyd of Sanford, NC. She is survived by her daughter, Melinda Ledden Sidak and husband J. Gregory, of Washington, DC, and their children, Gunnar, Christian, Colin, and Lachlan; her son Jonathan Ledden and wife Krista of Orlando, FL, and their children Samuel and Molly; brother James M. Lloyd of Winston-Salem. Her grandchildren were the light of her life and Jean was extremely proud of her entire family's participation in dance, theater, and music. Memorial donations may be made to: Sidak Chorister Scholarship at St. Alban’s School in Washington. DC; or The Orlando Ballet. Powell Funeral Home in Southern Pines is serving the Ledden family.